On June 13, 2013, at Formats bookstore, l’Agence TOPO is launching a major book publication about . 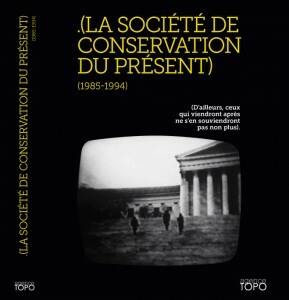 (La Société de Conservation du Présent), a visual arts collective that fused visual art, technology and archives through the profuse artistic production they engaged in from1985 to 1994. Steered by Sonia Pelletier in collaboration with Michel Lefebvre and Bernard Schütze, the publication underscores the prominence of this group and pays tribute to the late Philippe Côté, a philosopher and conceptual artist. He was one of the three founding members of the . (SCP) along with the software author Alain Bergeron and the photographer, pamphleteer and author Jean Dubé. The critical, sharp, humorous, and sometimes irreverent trio bore witness to a new intellectual, artistic, and social dynamic. The world order, the twentieth century, language, technology, museology, the free circulation of archives, and Third World debt were some of the many fields of investigation that led them to take a stance and spurred them into action. The often furtive but resolutely prolific collective made its mark through its rubber-stamped words and icons, its slogans and pictograms, and its zealous (mis)use of punctuation in numerous printed documents and laminated plastic cards, which conceptually illustrated their key themes. At the dawn of new media art, the group was also a forerunner of the then-nascent digital networks field. Partly bilingual (French and English) and extensively illustrated with photographs and archival documents from the Philppe Côté archival fonds, the monograph comprises an important chronological account of the collective’s activities by Bernard Schütze culled from interviews he conducted with Philippe Côté several months before his demise. The authors Denis Lessard, André-Louis Paré and Michaël La Chance respectively write about one of the collective’s three founding principles: 1. The Archive principle 2. The Art of the Promise and 3. Idleness. The preface is penned by Sonia Pelletier, who also reworked a previously published text about Philippe Côté’s cartography project. Nearly a hundred of his laminated plastic cards have been reproduced in the publication to foreground this extensive production. As privileged witnesses, Philippe Bézy, François Côté and Guy Sioui Durand share their lived experiences with and around the . (SCP), revealing both the context and some of the collective’s flagship projects. The authors André Éric Létourneau, Philippe Lefebvre and Michel Bézy describe the scope of the groups’s technological achievements, among which: . (Loplop), a text/image animation software, . (Rrose) a telematic text messaging software, (La ‘Calembredaine), a random poetry generating software, and the Musée Standard, arguably one of the first graphic interface online museums in the world. A chronology and a bibliography complete the volume. The book will be available at Formats bookstore and distributed by Édipresse. The launch of this publication marks the first research development activity-in collaboration with Philippe’s brother, Francois-drawing on the Philippe Côté archival fonds. Through a playful and informational website, to be launched in fall 2013, l’Agence TOPO is planning to make a large selection of these . (SCP) archival documents available. Agence TOPO is an Montreal based artist-run centrer dedicated to the production, dissemination and distribution of independant multimedia works. The publication of his book is made possible through the support of the Conseil des arts et des lettres du Québec and the Canada Council for the Arts..